We are Mattia and Anastasia, a young Italian-Russian couple with a passion for traveling and tourism. After living abroad for many years we settled down in Rome. While working in the tourism industry, we decided to start our own tour company. We both are in love with Rome and want to share this passion with you, we’ll suggest you the best places to have a coffee or a tiramisu, some nice areas to hang around and recommend you good – and not touristy! – restaurants in the city center. Turtle Tour offers group, private and custom segway tours of Rome in multiple languages. All tour guides are locals or expats that have been living in Rome for many years. We offer insider tips so you can make the most of your visit and the opportunity to see Rome from a local’s perspective. 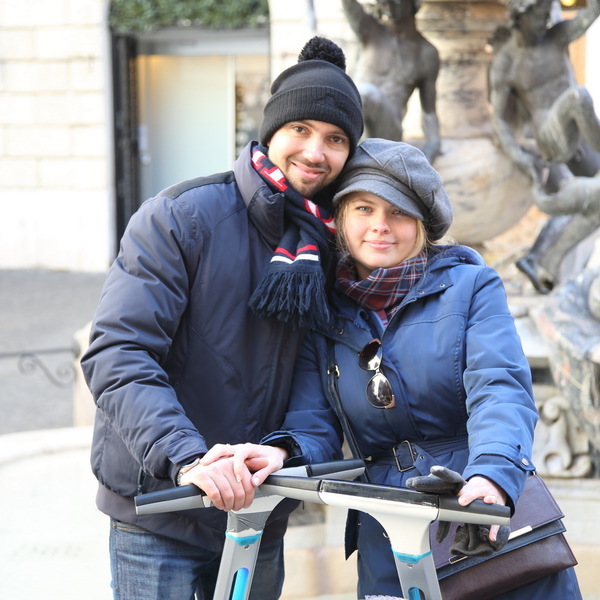 Tour rome with the brand new Airwheel S5. This electric scooter is easy to maneuver, stable and extremely safe. Our experienced guides start each tour with a training session to ensure you are comfortable using the Airwheel s5. Languages: English, Italian, Russian, German, French or Spanish.